WINNIPEG, MB: July 20, 2015 – Winnipeg’s Largest Hip Hop Show of the year, YWG LOVES HIP HOP, is coming to MTS Centre on Thursday, September 3, 2015. 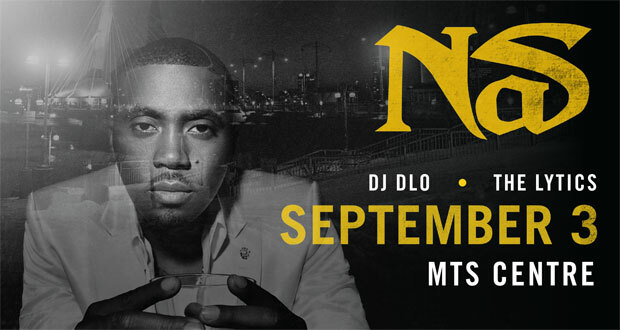 YWG LOVES HIP HOP will be headlined by Grammy nominated rapper and Hip Hop Legand Nas along with special guest Tink. Local artists The Lytics & DJ DLO will open the show. Tickets go on-sale Friday, July 24 at 10:00 am through Ticketmaster. Nas’ musical career began in 1991 when he was featured on Main Source’s track “Live at the Barbeque”. His debut album Illmatic, released in 1994, received universal acclaim from both critics and the hip hop community; it is frequently ranked as one of the greatest hip hop albums of all time. He did Illmatic’s “N.Y. State of Mind” in one take. Nas’ follow-up album, It Was Written, debuted at No. 1 on the Billboard Charts, stayed on top for four consecutive weeks, went platinum twice in only two months, and made Nas internationally known. From 2001 to 2005, Nas was involved in a highly publicized feud with rapper Jay-Z. In 2006, Nas signed to Def Jam. In 2010, he released a collaboration album with reggae artist Damian Marley, donating all royalties to charities active in Africa. His eleventh studio album, Life Is Good, was released in 2012, and was nominated for Best Rap Album at the 55th Annual Grammy Awards. Nas is often named as one of the greatest hip hop artists. MTV ranked him at number 5 on their list of The Greatest MCs of All Time. In 2012, The Source ranked him No. 2 on their list of the “Top 50 Lyricists of All Time”. In 2013, Nas was ranked fourth on MTV’s “Hottest MCs in the Game” list. In 2014, About.com ranked him No. 1 on their list of the “50 Greatest MCs of All Time”. He has five number 1 albums on the Billboard 200, tying him with Eminem and Kanye West for second place among all-time rappers.